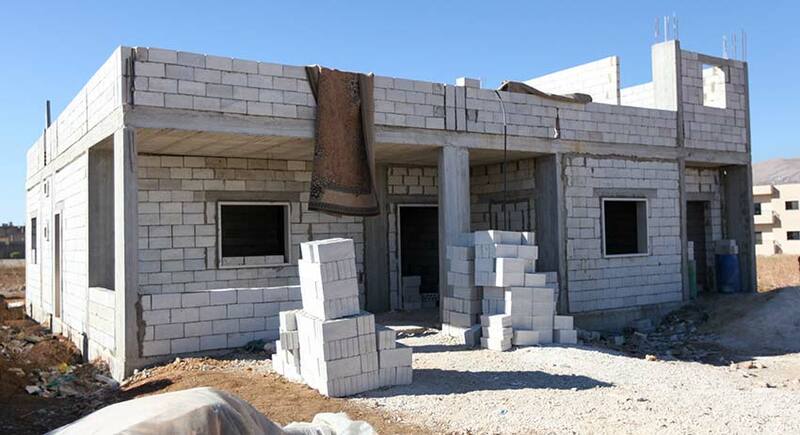 Fundraiser Mary Smith writes about her first time visiting refugee camps and Habitat for Humanity projects in Lebanon. I boarded the Middle East Airlines plane with a mixture of emotions; excitement, intrigue and trepidation. Having been a fundraiser in the international development sector for the last 12 years I’ve travelled to many places to witness and experience the different faces of poverty. But I had never been to the Middle East. I don’t think I fully appreciated how deeply I would be affected by the things I saw and the people I met. The Syrian crisis is now in its seventh year and millions of people have fled across the mountainous border with Lebanon, seeking safety and refuge. Lebanon was already a country flooded with internally displaced people and refugees in part due to its own troubled history, but also due to the influx of hundreds of thousands of Palestinian refugees in the aftermath of the Israeli-Arab conflict in 1948. Once on the ground in Beirut, my first visit was to the Beqaa Valley, a name I had heard so often from the news and other humanitarian agencies and reports. I was filled with nervous anticipation and so felt a sense of mounting frustration as I realised our journey was to be delayed due to snow on top of the mountainous pass which we had to navigate. Our route up the steep roads out of sunny Beirut became increasingly wet, and then slushy followed by dense fog and snow. How quickly the weather could change and how vulnerable you must feel living here, especially in a refugee tent. I learnt a lot that day in the Beqaa Valley, most of it difficult to come to terms with. One family told me that they had left Homs when the fighting became so bad that their children couldn’t sleep but now they were in Lebanon, away from the fighting, they couldn’t afford the medication to ease their children’s anxiety. The next day we set out to visit a couple of the Palestinian refugee camps in Beirut. 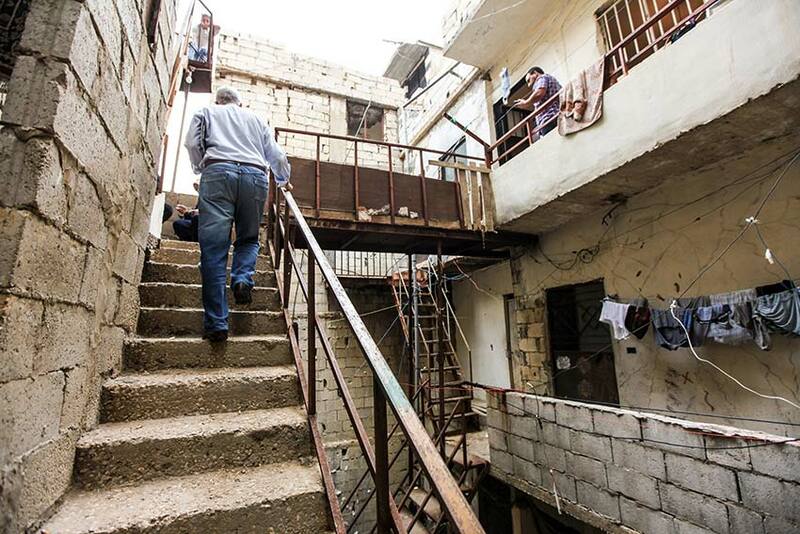 Bourj Barajneh camp had been developed in 1958 for an initial 10,000 refugees on a 1km square plot of land. 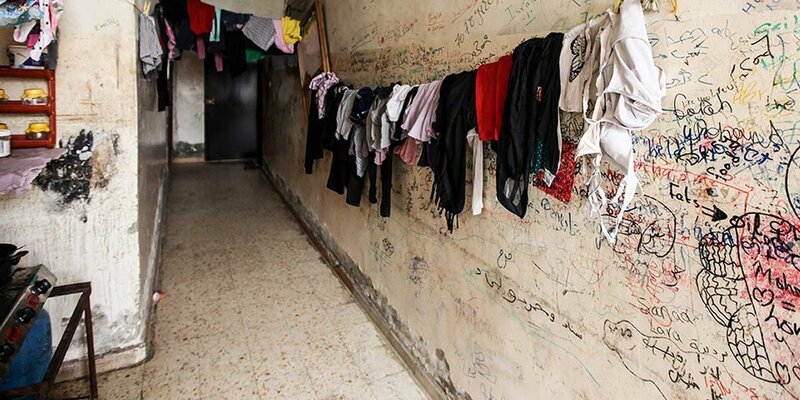 Since then, with natural population growth, the influx of Palestinian refugees from Syria and the more recent Syrian refugees, the camp is now ‘home’ to over 45,000 people and still limited to the same sized plot of land. As we walked into the camp with our guide, the streets became alleyways, and these became damper and darker as the shelter density increased. What had originally been designed as single storey shelters (without proper foundations) had risen, illegally, to six or seven storeys high. In some cases, the buildings at the top were wider than the buildings below and in a country prone to earthquakes I could only marvel that these precarious apartment towers were still standing at all. A sprawling network of electrical wires dangles haphazardly along the alleyways. These are often intermingled with dripping water pipes and approximately every month, someone is electrocuted. Habitat for Humanity is working to ensure that houses are safe and secure and that there is adequate sanitation in kitchens and bathrooms. In particular, it is working to preserve the dignity of the elderly, the sick, the disabled and the vulnerable. My spirits were lifted when we visited one of the local NGO projects which bring the elderly Palestinian women together weekly to get them out of their houses and to make sure they have a good meal. They were a lively bunch and excited to receive foreign visitors. I met one lady called Aisha who was 82. She had left Palestine with her parents when she was 12 and had lived in Bourj Barajneh camp ever since. 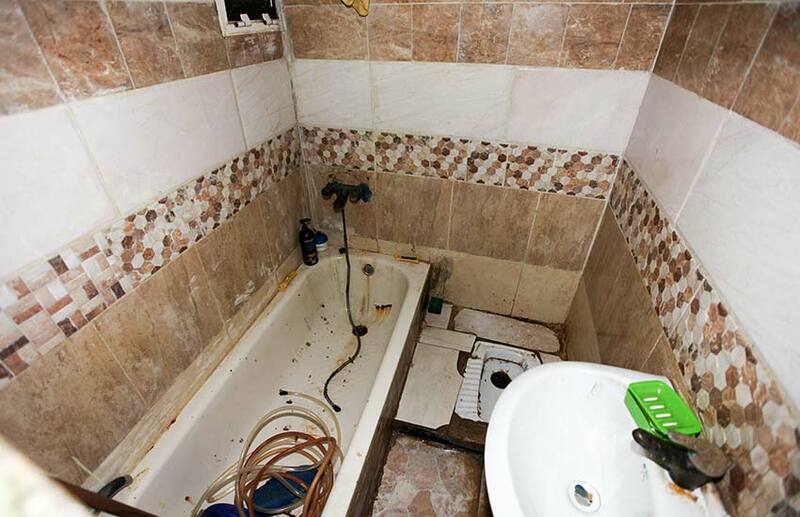 Was a new bathroom and kitchen really transforming these people’s lives? Was that all we could do?! I have wrestled with the sense of hopelessness that I felt and my mind has been searching for something more positive to hold onto. And I think I have found it. We are planning to dramatically scale up operations in the Middle East. Following on from my visit, I now feel better equipped to go out and talk to people about the plight of the refugees, the living conditions that they have to endure and the work that we are doing to help. Dani, Habitat’s leader in Lebanon, asked me if I wanted to visit more families and I graciously declined. I honestly couldn’t take anymore – the smell, the dampness, the depression was weighing heavily on me. I was on the verge of tears as we drove back to the hotel. So much sadness and so little hope. It’s been a month now since I returned from Lebanon and I’ve reflected deeply on my experience and all that I saw. It felt like such a privilege to be able ’to go home’ and I don’t think I will take that for granted again. We’ve learnt that some Syrian families in Lebanon are reaching a point of desperation that they too are making the journey back, to go home again. 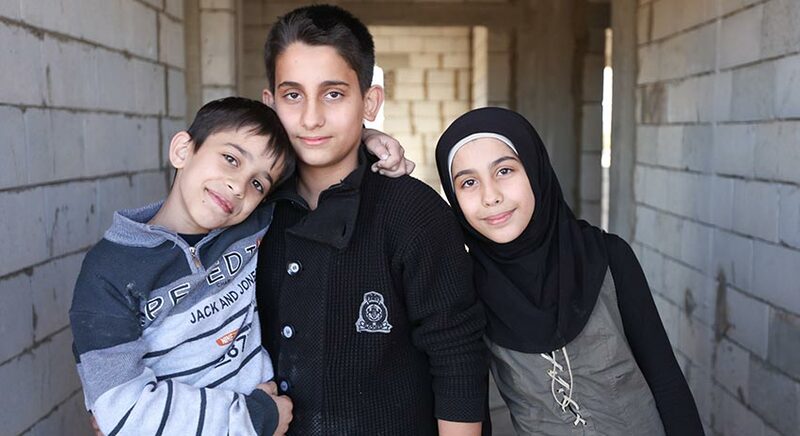 Our team in Lebanon has an ambitious project to raise nearly $7m to help over 75,000 people in the next three years and this will impact the Syrian refugees, Palestinian refugees and the host communities. I have faith that even in those dark and damp shelters and those cold bleak tents, Jesus is there. We visited one ‘apartment’ which was some space on top of a roof which had been turned into a makeshift home which a lady had lived in for 40 years. A relative showing us around looked at the green and healthy plants growing in pots and said that in such terrible living conditions, they were her only hope. And she smiled and said that the one benefit of having a leaky roof was that when it rained the plants didn’t need watering. The human spirit is indeed a resilient one. Mary Smith is Associate Director for Leadership Giving at Habitat for Humanity, Europe, Middle East and Africa.